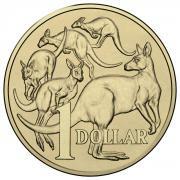 The one dollar coin was first introduced on 14 May 1984. Planning for a one dollar coin commenced as early as the mid-1970s. It was recognised that Australia needed a higher value coin which could be practically used in coin operated machines and to replace the one dollar note which had a short service life through high use. Mr Stuart Devlin was commissioned to design the reverse of the new coin. The five kangaroos design was chosen from submissions received from the designer. Commemorating the International Year of Peace. Sculpted by Horst Hahne. No one dollar coins were produced in 1987. No one dollar coins were produced in 1989, 1990 or 1991. The environmental theme reflects the relationship between the environment and water quality by depicting a tree sculpted in the flowing form of water. The design incorporates the logo of Landcare Australia to raise awareness. Commemorating the centenary of the Constitutional Conventions that led to Federation and the role of Sir Henry Parkes, widely acknowledged as the “Father of Federation”. Designed and sculpted by Wojciech Pietranik. Commemorating the centenary of the birth of Sir Charles Kingsford-Smith, aviation pioneer. Designed and sculpted by Wojciech Pietranik. Commemorating the International Year of Older Persons, incorporating the United Nations logo for that year. Designed and sculpted by Wojciech Pietranik. Commemorating the Centenary of Federation. Sculpted by Wojciech Pietranik. Commemorating the International Year of Volunteers. Sculpted by Wojciech Pietranik. Commemorating Australia’s Volunteers. Designed and sculpted by Wojciech Pietranik. Commemorating the Centenary of Women’s Suffrage. Sculpted by Vladimir Gottwald. Commemorating the 60th anniversary of the end of World War 2. The design was inspired by a newsreel image. Sculpted by Wojciech Pietranik. Commemorating Australia’s hosting of the Asia-Pacific Economic Cooperation Forum (APEC). Sculpted by Wojciech Pietranik. Commemorating the Centenary of Scouting in Australia. Sculpted by Caitlin Goodall. 100th year of the Age Pension. Designed and sculpted by Wojciech Pietranik. Commemorating the Centenary of Girl Guiding in Australia. Designed and sculpted by Wojciech Pietranik. Commemorating the Commonwealth Heads of Government Meeting (CHOGM) in Perth, Australia. Commemorating the Centenary of ANZAC 2014-2018. Commemorating 35 years of the Australian $1coin. The design includes the number '35' and the letter 'A'. 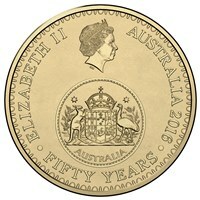 Commemorating 35 years of the Australian $1coin. The design includes the number '35' and the letter 'U'. 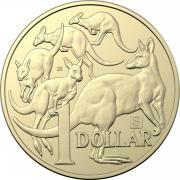 Commemorating 35 years of the Australian $1coin. The design includes the number '35' and the letter 'S'. These are final mintages where the numbers have been published in an Annual Report and all coins have been issued. Items marked not available will be updated when they pass the Annual Report and issue test.